Galen Catholic College students from Years 7 to 12 will showcase their students’ creative talent on Tuesday night at their annual Arts and Technology Exhibition. This exhibition is of particular importance to Year 12 students as it’s their chance to show works they have been developing since the beginning of the year. Work on show will be from a variety of creative VCE courses including Art, Studio Art, Visual Communication Design, Media, Product Design and Technology, Food Technology, Drama and Music. The Galen Arts & Technology 2014 Exhibition opens on Tuesday night 6.30pm at the Max Fletcher Auditorium. The exhibition will also be open during the week and closes on Friday 17th at 4.00pm. 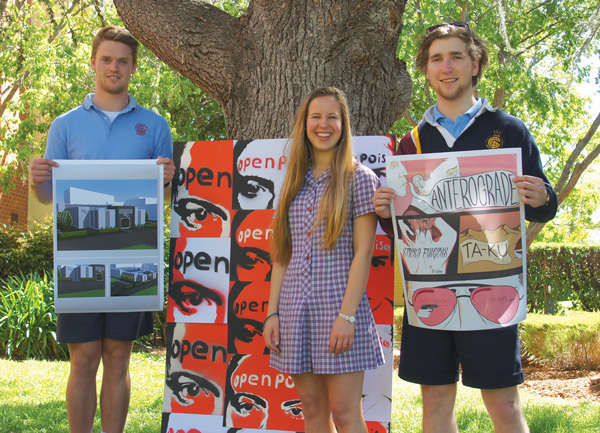 Year 12 Galen College students Jackson Clarke, Annie Brien and Callum Saxby will be among many students proudly showing their talent at the Galen Arts & Technology Exhibition on Tuesday night.